I realized I never finished sharing photos of the home my friend Kate and I staged recently. Inquiring minds must want to know: what goes into staging a home? To put it simply, it's interior design for the minimalist. The home office of this house is a perfect example of how the bare bones of design elements can go a long way. But when you're trying to sell a home, no one wants to envision the clutter that will inevitably overrun the space. They want to see an immaculate space; a room full of possibility. 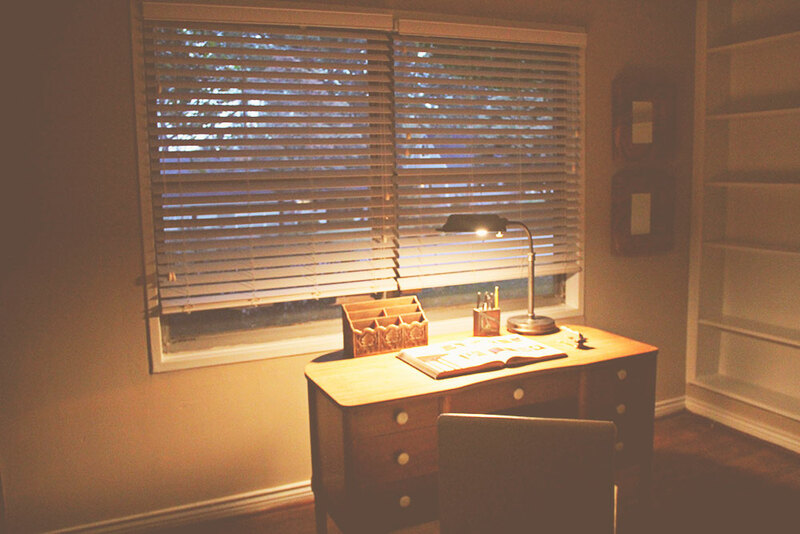 The way we achieved that is through bringing in as little as we could, while still evoking the feel of a home office. To pair with my mid century desk [yes, this is my personal office desk that I've been in the process of refinishing, and I miss it terribly! ], I went with just a few styling props for the table. 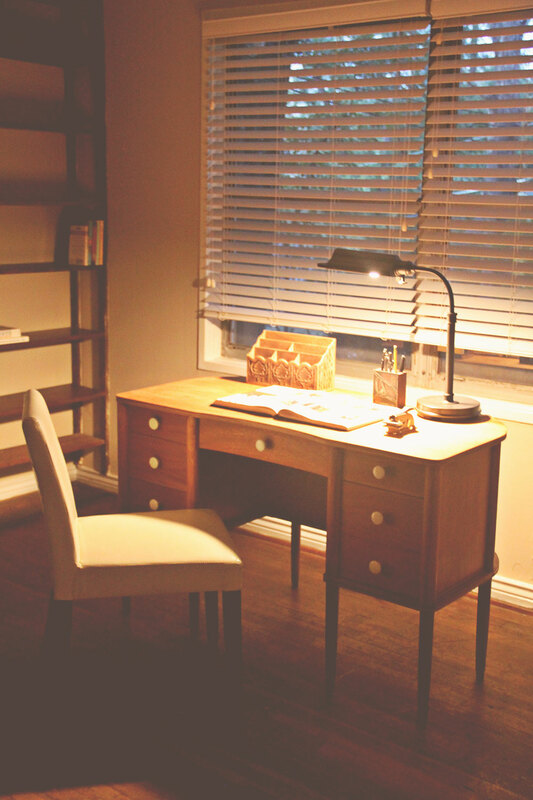 Nothing too cluttered, but just enough so that it feels like someone may happen to sit down and peruse the book sitting on the table. Having a desk, chair, some styling props, and a couple mirrors for their reflective qualities [I didn't have a great photo of this, but you can see them in the photo above], is really all we needed to make this feel like a promising work space. Sure, we could have styled every single shelf in here, but that would have been A LOT of styling props, that ultimately wouldn't add much buying potential to the space. Buyers need just enough inspiration to see the potential of a room and how they can see themselves using it. Just a few books and props in one section of the office was just what this room needed. The home has just been on the market for about a month now, and the owners just lowered the price. I'm no real estate agent [though I'd LOVE to get my license one day!] but this house is a great deal in a fantastic school district in Atlanta. I may not have kids, but I know how crucial purchasing a home based on the local school system can be. So be sure to check it out if you are on the hunt for a home!